It seems like everyone in the investing world this week is talking about yield curves inverting. It’s the topic du jour, similar to things like golden crosses and 200-day moving averages. The difference is that this one is more intermarket oriented. Observing the behavior of one asset class to help make decisions on another is called intermarket analysis, or “cross-asset” in some more institutional circles. I don’t think there is much more for me to say at this point about the yield curve. The crew over at The Chart Report pretty much covered it all beautifully last week. The short end of the curve (the U.S. 10-year Treasury yield minus three-month) turned negative, but the long end of the curve did not. The 10s-30s spread is steepening and controlled by free markets versus the Fed-controlled short end. We’ve seen this happen before, like in the 90s for example, without it sparking bear markets. So, which is the benchmark for the yield curve? I don’t think there is one. For me, it just depends on who you are: a bank, a hedge fund, a government? For most of us, this does not affect us directly. The only thing we can do is take the information in front of us and make the best decision we can make moving forward for our portfolios. This brings me to my point today: The overthinking of intermarket analysis. If A happens, then B should happen, therefore C will do this and we should buy D in order to profit from it, and maybe hedge it with E. I’ve gotten hurt doing it this way. Younger up-and-coming technicians come to me with this sort of stuff all the time too. The advice I give, which is similar to what was given to me when I was in the overthinking phase of my intermarket progression, is keep it simple. If you like A, buy A. If you think B goes down, short B. When you finally get to E, who the hell knows? This fourth and fifth derivative trading stuff is not something we want to be doing. Now to be clear, there’s nothing wrong with using intermarket analysis. In fact, I pride myself in doing just that. For me, it’s the best information we can get from the market. 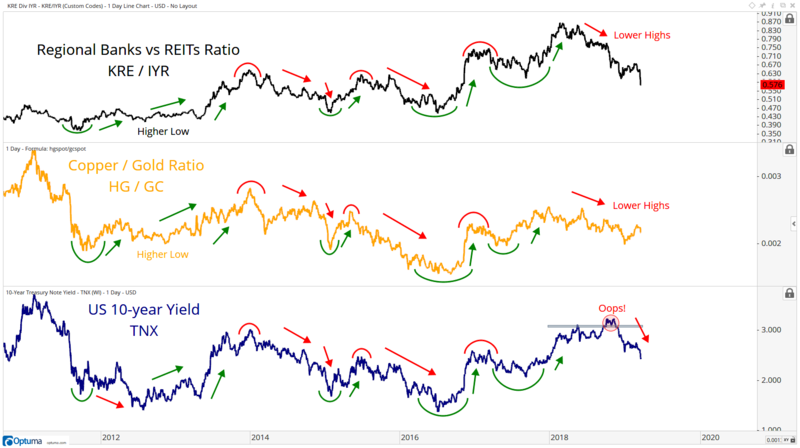 Are the commodities markets and stock markets confirming what we’re seeing in bonds? Or are there divergences? For example, when U.S. 10-year yields made new highs in October last year, there were bearish divergences in stocks and commodities. I pointed this out just before rates completely fell apart that stocks and commodities were not agreeing with the bond market. Below is an updated chart where you can see this historic positive correlation that was diverging in the fourth quarter. The trade here was to buy bonds. But I would be lying to you if I told you that rates potentially falling apart and bonds ripping wouldn’t most likely happen in a scenario where stocks were falling. This divergence in commodities and stocks versus what the bond market was doing was one of the many reasons why we were so bearish stocks throughout the entire fourth quarter of 2018. I’m a John Murphy disciple. His intermarket work was a huge inspiration to me early in my career. Tyler Wood, director of the CMT Association, recently called me J.C. “John Murphy, Jr.” Parets. And while I think that’s a little aggressive (I haven’t earned that name yet) it does speak to how much intermarket analysis I’m doing on a daily basis. I find it incredibly helpful and it really keeps things in perspective for me. But, listen, if you’re going to cash in your stock portfolio just because the interest rate on one bond is higher or lower than on another bond, I think it’s a mistake. Bear markets and recessions historically start 14 to 18 months later, on average, depending on who you ask, if bear markets or recessions even happen at all. So if you’re short U.S. stocks right now, I hope you have other reasons and proper risk management procedures in place. But a yield curve inversion is not a reason for me. The lesson that I’ve had to learn the hard way over my career is to trade what is in front of me. If you like bonds, buy bonds. If you like Microsoft, buy MSFT. It reminds me of a conversation I had with Chris Verrone a long time ago. We actually discussed it in a podcast that him and I did together about two years ago. This conversation I’m referring may have been in 2013 or something like that. Chris was giving a presentation in New York and happened to be really bullish healthcare at the time, based on a number of factors including price, relative strength and others. For whatever the reason, China was a big underperformer at the time and looked terrible. I questioned how aggressively bullish he was about healthcare considering what was happening in emerging markets. Basically, if you like healthcare, just buy healthcare. As it turned out, healthcare stocks exploded from there and China basically did a lot more of nothing for a long time. I was looking at it all wrong. I was ignoring the strength out of healthcare and was instead focused on the loser. China’s underperformance was blinding me from the giant elephant walking right in front of me. I should have been putting more weight on what institutions were buying instead of what they were not buying. This lesson has stuck with me for a long time. I am lucky that I get to have conversations with really smart traders and analysts every day. We even joke about this sort of intermarket overthinking rabbit hole that we still sometimes catch ourselves going down. If you like stocks, buy stocks. I don’t think it makes sense to sell strong names just because the interest rate on one bond crossed above or below the interest rate on another bond. It’s the same thing with these golden crosses and death crosses. One lagging indicator crossing over another lagging indicator is not a reason for me to sell stocks that are breaking out.